A Phase II Environmental Site Assessment means physical or chemical testing of soil, air, or groundwater. However, it is best described as actual physical or chemical testing of any kind. A Phase II Environmental Site Assessment may include drilling, soil studies, groundwater testing, a lead paint survey, an asbestos survey, a mold survey and other tests. A Phase II Environmental Site Assessment sometimes follows a Phase I Environmental Site Assessment where additional problems have been found, or additional regulatory requirements exist. The Alchemist, Adam McLean (1948-). Glascow, Scotland. 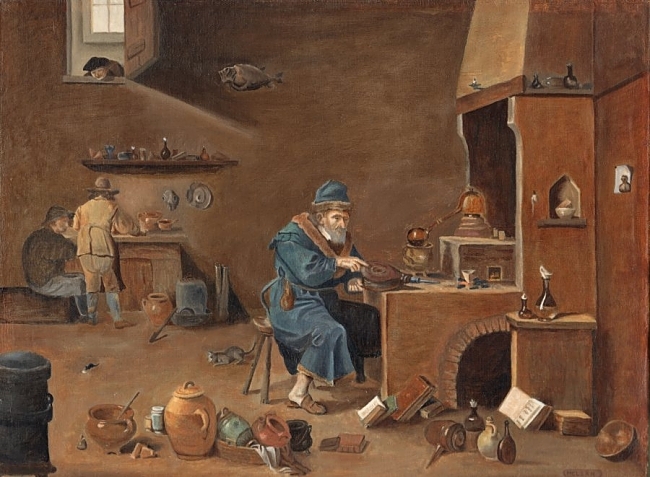 Copy/rework a 17th-century painting of the same name by David Teniers (1610-1690) of Belgium. Original, Royal Museum of Fine Arts, Brussels. Permission granted by Adam McLean. Be aware if the state where your property is located may be subject to any transfer statutes. Among others, New Jersey, Connecticut, and Indiana have statutes requiring responsible parties to provide formal, legal disclosures and either remediate or provide for the remediation of contaminated properties prior to transfer. This is another occasion where the assistance of a real estate attorney is strongly advised.